Prominent & Leading Manufacturer from Thane, we offer non cementitious elastomeric coating and terrace water proofing elastomeric coatings. Non Cementitious Elastomeric Coating is a single component, water based high solids, elastomeric acrylic resin base coating. On application, it forms a waterproof elastomeric seal in the form of monolithic uniform membrane. Single component elastomeric water proof easy to apply by brush, roller or spray Adheres strongly to a wide Variety of sound substrates such as concrete, metal, modified bitumen, wood UV light protection maintains aesthetic appearance & aging. Prevents growth of moss & fungus Light weight-puts less stress on the building. User friendly Attractive color shades available if required. We are looking for queries from Mumbai / Maharashtra only. 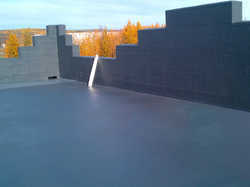 Ryot4 Fibcoat is Terrace Water Proofing Elastomeric Coatings. Terrace vertical surface, passage area. We are looking for queries from Mumbai / Maharashtra only.